An evening of Manc music continues. 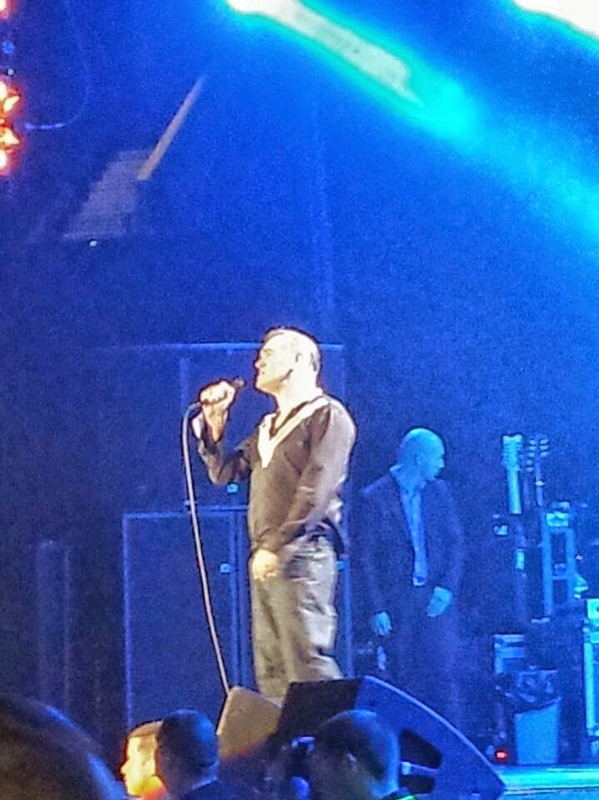 After running from Glasgow's Stereo where The Slow Readers Club delivered a glorious set of new songs, I make it to Scotland's biggest arena to catch Steven Patrick Morrissey do the same, with only a handful of old favourites thrown in. Opening with The Queen Is Dead has the (far from capacity) crowd at Glasgow's Hydro Arena enthralled. They are delighted too with Suedehead, an early solo effort from Morrissey. The momentum is lost somewhat over the next hour or so as Morrissey and his loyal, talented band of musicians play most of his new album. Staircase At The University, World Peace Is None of Your Business, Kiss Me A Lot and Istanbul are fine tunes, many augmented by some fine Latin American accompaniments, but, by this point, a huge section of the Saturday night crowd are more concerned with getting another pint in and having a chat than actually listening. This seems to become increasingly more common up and down the country. It's not helped by the fact that the sound system at The Hydro leaves a lot to be desired. At best, it sounds like a bad festival PA system. When punters are paying fifty pounds a ticket, surely they deserve better? I would have reservations about attending another gig there unless sound problems are sorted out. One Of Our Own gets a great reception however although alarmingly the biggest cheer of the night is reserved for his now infamous Independence referendum comment. By the time the delicate Yes, I Am Blind finishes, the crowd have completely switched off again. Trouble Loves Me is a beautiful song yet again lost on the majority of the crowd. I am somewhat dismayed that even those in Smiths shirts can't be bothered to show Morrissey some respect and actually listen. An acknowledging cheer goes up as the second of four Smiths songs begins. Stop Me If You've Heard This One Before re-engages the audience and we even get a bit of a sing along. In truth, the songs from last year's World Peace album tonight are every bit as good as those songs from 30 years ago. The highlight for many in the crowd is a stunning Every Day Is Like Sunday. For me, it is easily the best song Morrissey has ever done. A heartfelt vocal. He never stops giving his all. What She Said keeps the crowd entertained but in truth Morrissey deserves a better crowd than the one here tonight. Meat Is Murder sees the band at their very best before Speedway ends proceedings but not before Morrissey rips off his shirt, kisses it and launches it into the crowd. He is a true entertainer and it was a privilege to see him. Sadly, someone in the crowd who went over the barrier during Speedway didn't see the full show as overzealous security staff bring him crashing to the ground in an incident that seemed to shock many in the crowd. An interesting evening. Morrissey's official Facebook page can be found here. He often speaks via True To You.